During a brief question-and-answer session, Reno resident Barbara Burnett told the California senator that her only problem with her presidential campaign is her opposition to the death penalty, and said that she needed to understand firsthand where Harris stands on the issue “for people like myself who have been through this.” Harris, a longtime opponent of the death penalty dating back to her days as a San Francisco prosecutor, explained her moral opposition to death as punishment in the criminal justice system. Harris’s comments, delivered during her first stop of a whirlwind day of campaigning in Northern Nevada, come as Nevada lawmakers again consider whether to take up the state’s longstanding death penalty this legislative session. Two Democratic lawmakers — Assemblyman Ozzie Fumo and state Sen. James Ohrenschall — are sponsoring a pair of bills that would eliminate Nevada’s capital punishment statute, which hasn’t been used to execute someone since 2006 despite 77 people being on death row. Gov. Steve Sisolak, who has said he believes the death penalty is appropriate in only “very extreme” circumstances, has not indicated whether he would sign such a bill into law were it to reach his desk. 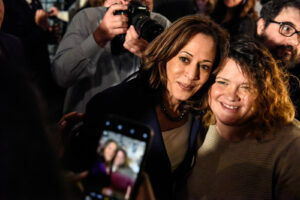 Burnett, whose grandfather was killed in a robbery in 1976, told The Nevada Independent in a brief interview after the event that she respects Harris “tremendously” but needed to hear the senator’s explanation on the death penalty for herself. State lawmakers are considering giving teachers a pay boost this session: Gov. Steve Sisolak has recommended a one-time 3 percent bump, while the Clark County Education Association is proposing to make that an annual increase. Harris’s plan would allow states to take the dollars they allocate toward teacher pay increases even further by putting up a 3:1 federal match against them. Nevada State Education Association President Ruben Murillo, who led the teacher roundtable, said in an interview after the event that Harris’s proposal would be a “win-win” situation by requiring investments by both the state and federal governments. “It would make a huge difference in the recruitment and retention of educators in Nevada,” Murrillo said. Harris also weighed in during the roundtable on the implications of kids not being able to read at grade level by the end of third grade, something Nevada lawmakers are grappling with this session as thousands of children stand to automatically be held back as a result of a Read by 3 law passed in 2015. 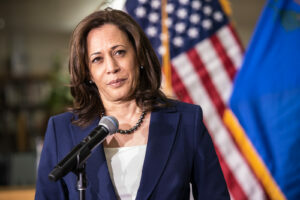 During a media availability with reporters Tuesday afternoon, Harris indicated that she would not include funding for a long-term nuclear waste repository at Yucca Mountain in her budget as president. 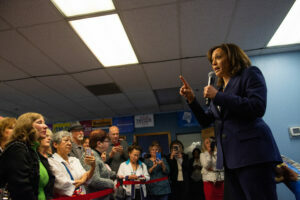 Harris said that there are “real serious problems with that” and that she is aligning herself with Sen. Catherine Cortez Masto, a staunch opponent of Yucca Mountain, on the issue. Later, in an address delivered at a Battle Born Progress event in Carson City, Harris praised Cortez Masto for pressing Energy Secretary Rick Perry over his department’s request for $116 million to restart licensing activities at Yucca Mountain. “Did anyone see Catherine today with Rick Perry? Oh my God. She tore it up. She tore it up,” Harris enthused. The California senator paid a visit to the Legislature and Capitol buildings Tuesday afternoon and was escorted to her final event of the day by Lt. Gov. Kate Marshall, Attorney General Aaron Ford and Treasurer Zach Conine. With a parade of Democratic 2020 hopefuls streaming through the state over the last few weeks, Nevada is still widely perceived to be a wide open contest ahead of its first-in-the-West caucus, despite suggestions that Nevada is Harris’s to lose because she hails from neighboring California. Still, Harris joked twice during her Tuesday visit that Nevadans are part of her extended family.